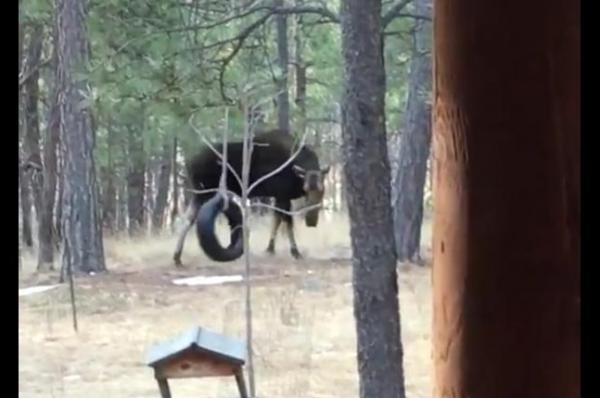 A Colorado man captured video of a curious moose playing with the tire swing hanging from a tree in his back yard. John Woods posted a video to Facebook showing the moose's Friday morning visit to his back yard in a wooded area of Black Forest. The moose investigates the tire swing before using its face to push and spin it. Woods said the moose, which he nicknamed "Momma Moose," has been visiting his yard for the past two years. Moose are very curious animals and will sometimes approach people, houses, or cars. Moose are generally docile towards humans, but may become more aggressive during the mating season of September through October. The name "moose" comes from the Native American word "Moswa," which translates to "twig eater." Responses to "Moose plays with Colorado home's backyard tire swing"